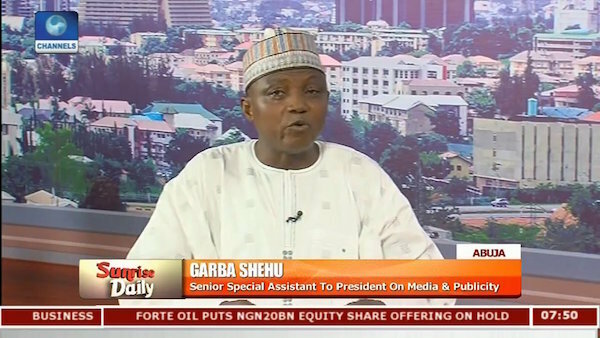 President Muhammadu Buhari’s Senior Special Assistant on Media and Publicity, Garba Shehu on Thursday said the Indigenous People of Biafra (IPOB) is a terrorist organization while Fulani herdsmen who have reportedly killed thousands of people are just criminals. Mr. Shehu made this known while speaking on Channels Television’s Sunrise Daily. The presidential aide said the IPOB has clearly indicated they are not interested in dialogue. “Initially yes, it is clear that the leader had himself shut everyone out of the whole process. “What more did anybody need to see coming from IPOB to act when they had declared a territory, they had made open clear threat to seize neighbouring states. They have printed passports, they have printed currency and they attack people illegally. What else do you need to act? He said: “We looked at this organisation, we analysed it, and it fits the description of a terrorist organization. Adiola pls sit down and listen to this man. This one is a high ranking government official too? Smh! What do you do with a criminal when you see one or found him killing people? Tell the truth and it shall set you free.